Want to be notified of new releases in Vimux/Binario? Binario is a responsive card-based & code-light Hugo theme. First of all, you will need to install Hugo and create new site. Also, you have git installed on your machine and you are familiar with basic git usage. After that, you ready to install Binario. There are three different ways you can install Binario. Choose one of the installation methods listed below and follow the instructions. For more information read the "Install and Use Themes". Download ZIP and extract to the themes/binario within your Hugo website. Now you can go to localhost:1313 webpage and the Binario theme should be visible. After you make sure that Binario works, you may start customizing the theme if it's needed. You can change number of columns, activate footer social icons, share buttons and much more. bio = "John Doe's true identity is unknown. Maybe he is a successful blogger or writer." 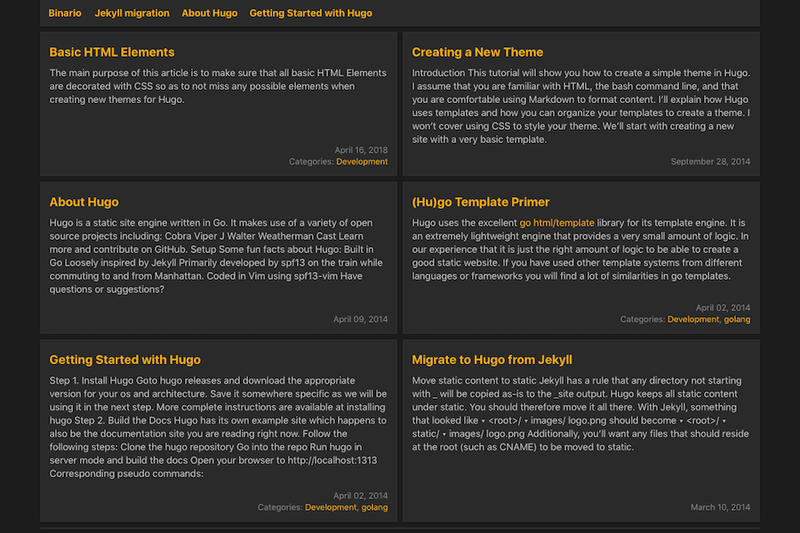 description = "Responsive card-based & code-light Hugo theme"
For more information about Hugo configuration files and all common configuration settings, please read "Configure Hugo" from Hugo official documentation. For more information about front matter variables and formats read "Hugo Front Matter" from Hugo official documentation. Binario includes some customizable configuration options that may be useful. By default, Binario works with two columns card layout (if it possible by screen size) for list pages, but you can also use one or three columns layout. Change Params.columnsto preferable value (from 1 to 3). You can also change this option for specific list pages in frontmatter params. All these CSS files will be added through the head.html partial after the built-in CSS file. You may activate post meta fields with .Site.Params.post_meta parameter. Binario uses default Related Content Hugo feature to provide "See Also"-like section. You can activate "Related Content" section with .Site.Params.related parameter. To display share buttons, set up [Params.Share] specific parameters in your site config file. You can add thumbnail image to your content page. Just put thumbnail. * image file in page bundle. With Binario, you have the option to display social icons in the footer. To display them, set up [Params.Social] specific parameters in your site config file. Web App Manifest is a simple json file with basic site info like name, description, icons, etc. This file tells the browser about your web application and how it should behave when "installed" (as PWA) on the users mobile device or desktop. To activate Web App Manifest you need to define MANIFEST custom output format & specify [Params.Manifest] parameters in your site config file. After that, you can specify [Params.Manifest] parameters. Have a bug? Please open a new issue. Pull requests are very welcome too, but please make sure they match the existing contributing guide. Binario is licensed under the MIT License.